One reason our nation is so screwed up: The partitioning of American minds. Liberals follow Rachel Maddow and MSNBC; conservatives follow Sean Hannity and Fox News. Libertarians follow The Daily Bell. So in many cases, we are talking past one another, citing slanted news as proof of our positions. I happen to think Rachel is far more informative, intelligent, and truthful than Sean, and way, way smarter than anyone at The Daily Bell. But could that be because she tells me what I already believe and they tell what I know to be lies? But to resist my natural urges, I do read Breitbart and occasionally, The Daily Bell, two perfectly awful publications. In my opinion, the former is a conservative shill for anything that benefits the rich, while the latter is an anti-government, libertarian device to hawk gold and silver to suckers. Both make me angry, and both make me wonder, “How can people believe such tripe.” But at least I can see what “tripe” is being believed. Reading “the other side” is a good learning device. Earlier this month, the United States government released its annual financial report for the year 2017 — a complete horror show. Right at the beginning of the report, the government explains that it’s “net loss” for the year was an unbelievable $1.2 TRILLION. Read that number again. $1.2 trillion. That’s simply staggering. It’s larger than the size of the entire Australian economy… and constitutes a loss of more than $2.2 million per minute. This is not a conspiracy theory or irrational fantasy. This is the Treasury Secretary of the United States of America publicly announcing that the federal government lost $1.2 trillion on page ‘i’ of its annual financial report. Either way, oh, horrors. Mr. Black informs us that our Monetarily Sovereign government, which has the unlimited power to create dollars, so never can run short of dollars, pumped more of those dollars into the economy than it took out. Is enriching the economy supposed to be a bad thing? He seems to think so. What’s even more alarming is that 2017 was a great year. There was no war. No recession. No epic financial crisis. In short, everything was awesome in 2017. Hmmm . . . Let’s see. The government pumped dollars into the economy; we had an increase in economic growth; unemployment is low, and inflation is low. Could there be a cause/effect relationship between adding dollars to the economy and economic growth? Of course, there is. If the government loses $1.2 trillion in a GOOD year, how much do you think they’ll lose in a BAD year? How much will they lose when they actually do have a recession to fight? Or another war. Or a major banking crisis? Recessions (vertical gray bars) tend to result from periods of declining deficit growth. They are cured by periods of increasing deficit growth. This is not an accident. Large economies have more dollars than do small economics. Thus, adding money, while controlling inflation, grows an economy. More importantly, how long can something so unsustainable possibly last? Can it last? The federal debt has been called “unsustainable” since 1940. The Daily Bell doesn’t acknowledge that fact and the basic economic fact that a Monetarily Sovereign nation can “sustain” any size debt denominated in its own sovereign currency. The so-called “unsustainable” Gross Federal Debt (red) has grown since 1940. So has the economy (blue). In the report, the government reviews its own assets and liabilities… effectively calculating its “net worth”. It’s just like how an individual might calculate his/her own net worth– you add up the value of your assets, like your home, car, and bank account balances. Then subtract liabilities like mortgage and credit card debt. The end result is your net worth. And hopefully it’s positive. The federal government, being Monetarily Sovereign, is not like you and me or any other individual. It also is not like city, county and state governments or private businesses, all of which are monetarily non-sovereign. Mr. Black doesn’t understand the difference between Monetary Sovereignty and monetary non-sovereignty, yet he writes about economics! To be clear, a net worth of negative $20.4 trillion means that the government added up the values of ALL of its assets. Every tank. Every aircraft carrier. Every acre of land. Every penny in the bank. And then subtracted its enormous liabilities, like the national debt. The difference is negative $20.4 trillion, i.e. the government has far MORE liabilities than it has assets. First, consider the impossibility of adding up all the federal government’s assets. What is the dollar value of the Grand Canyon? What is the dollar value of Yellowstone National Park? A used aircraft carrier? The Congress and the White House? The Washington Monument? A camp or a fort? As if that were not sufficiently impossible, tell me the dollar value of a government that has the unlimited ability to create dollars? Think about it. If you owned a printing press that endlessly and legally could print dollars, what would you be worth? The government’s net worth is hopelessly negative: MINUS $20.4 trillion. And that’s worse than its result from the previous year’s MINUS $19.3 trillion– meaning that the government’s net worth decreased by about 6% year over year. If the government were a business, it would have gone bankrupt long, long ago. Finally, one true statement from The Daily Bell. Yes, if the government were a business, it would have gone bankrupt long, long ago. So, Mr. Black, think very carefully: Why has the government not already gone bankrupt? On top of that, though, the government separately calculated its long-term liabilities from Social Security and Medicare. As we frequently discuss, both Social Security and Medicare are running out of money. Yes, The Daily Bell does frequently make that regrettably wrong statement. But both Social Security and Medicare are federal government agencies. No federal government agency ever can run out of money unless Congress and the President want that agency to run out of money. All the hand-wringing about Social Security and Medicare and their so-called “trust funds” running out of money is completely bogus — a performance devoted to fooling the public. And according to the government’s own calculations (on page 58), the “total present value of future expenditures in excess of future revenue” for Social Security and Medicare is MINUS $49 TRILLION. This merely means that Social Security and Medicare will spend more than the total of FICA taxes. But, contrary to popular wisdom, FICA does not fund Social Security and Medicare. The federal government does. Even if FICA collections totaled $0, the federal government could continue funding Social Security and Medicare, forever. Essentially this means that the two largest and most important pension and healthcare programs in the United States are insolvent by nearly $50 trillion. Altogether, the government is in the red by almost $70 trillion. Even if those questionable figures were correct, they merely would mean that the federal government is projected to pump 70 trillion more dollars into the economy than it takes out. The Daily Bell doesn’t understand that enriching the economy by $70 trillion is a good thing for the economy, and no burden whatsoever on the federal government or on federal taxpayers. It’s remarkable that this is not front page news. There has not been a single utterance from mainstream media about the pitiful, dangerously unsustainable finances of the federal government. Yes, again “unsustainable.” But as usual, The Daily Bell is wrong, because one of the major problems facing the U.S. is that mainstream media do, in fact, wail about the so-called “unsustainable” finances of the U.S. Ignorance on display. 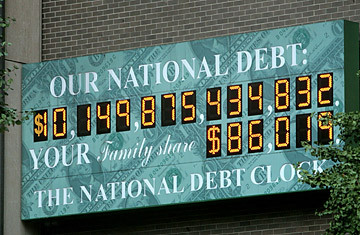 Your family does not owe a penny of the federal debt. I’m certainly not suggesting that the sky is falling, or that there’s some imminent disaster that will strike tomorrow morning. But that is exactly what Simon Black, the author, is suggesting, and it is diametrically wrong. If however, the federal deficit and debt were declining, there would constitute an imminent disaster. The last time the federal debt declined was during the Clinton administration (1998-2001), and that decline caused the recession of 2001. President Clinton ran a surplus from 1998-2001, which caused a recession. The recession was cured by deficit spending in 2001. But any rational person needs only look to the pages of history to find dozens of examples of once-dominant powers who were crippled by their excessive debts. It may take several years to feel the full impact. But it would be utterly foolish to believe that this time is different. Tellingly, Mr. Black does not provide even one example of a Monetarily Sovereign, “dominant power,” that was crippled by debt. A Monetarily Sovereign nation can be crippled by several things — war, natural disaster, giving up its Monetary Sovereignty (as the euro nations have) — but debt isn’t one of them. My suggestion to Mr. Black and The Daily Bell: Return to selling gold to suckers. You will do much less damage that way. That said, I’ll continue to read The Daily Bell (once in a while). It’s painful, but it’s revealing and darkly entertaining. Breitbart, too. As for Hannity — no, that’s too painful. How much ignorance can a human survive? 10 Responses to Liberals, conservatives and gold bugs talking past each other. In the FRED chart you posted that shows Federal debt and GDP, one disturbing feature of the chart is how those two lines converge after the great recession. Prior to that there was a fairly consistent gap, which had to do with the velocity of federal deficit dollars spent into the economy that helped to drive higher rates of GDP. Since 2010, the rate of debt growth has increased dramatically relative to GDP. This trend has everything to do with the widening gap between the 1% and the 99%. Federal deficit spending today is largely helping enrich the 1% at the expense of everyone else (new Republican tax law being the latest example). While increasing federal deficit spending is certainly sustainable, the current trend on how that deficit spending is being used in the economy is most assuredly not. I like your analysis. Of course. nothing says that deficit spending should proportionately increase GDP. There are far too many factors influencing GDP for there to be a proportionate response to one factor: Deficits. As you noted, the point is that deficits are not “unsustainable” and in fact are beneficial to economic growth. Totally agree that deficits by themselves don’t necessary drive proportional responses in GDP, but federal spending does. Deficits (outside of recessions) are driven by policy choices and those choices can have widely varying economic effects, both good and bad. Trillion dollar deficits based primarily on tax breaks to the wealthy will have a much different economic impact than trillion dollar deficits spent on infrastructure, health care, or education. While the former is not necessarily bad, the latter is certainly more beneficial for the 99%. 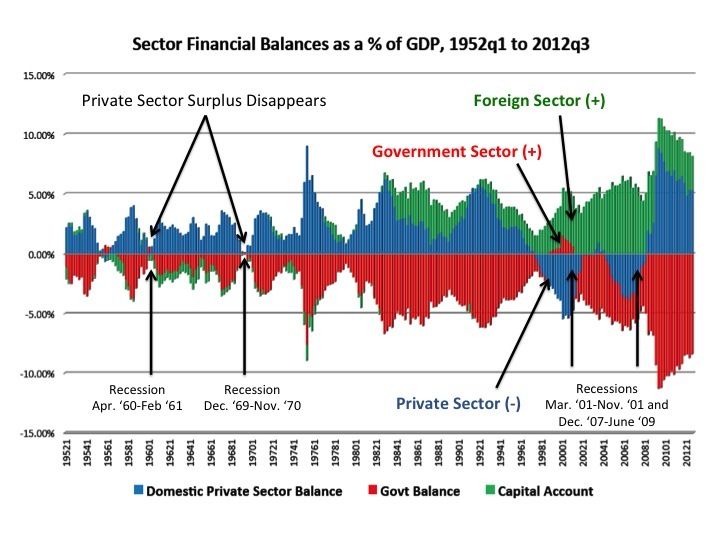 My point in the first post was that if the federal deficits post 2010 were based on public investment rather than Wall Street handouts (including low interest rate monetary policy), tax breaks, corporate subsidies, and foreign defense spending, then it is unlikely we would have seen the convergence of GDP and federal debt. It is also likely that wealth/income inequality would be in a much better condition than is evident today. Increasing federal deficits are both desirable and sustainable, increasing wealth inequality is neither. Both are policy choices. There is a way of writing GDP in terms of fiscal deficit. The economy runs on fiscal deficits. If UBI is added to fiscal deficit, GDP increase to (1+K) UBI. K, the economic multiplier for the economy. For USA it is 4. Probably the same for all economies. This boost is = 5*UBI. All this money in peoples’ hands will do wonders because private enterprise is self interest. There will automatically improvements to schools, roads and so on, people like nicer surroundings and a clean environment. What did this cost? UBI Is in the nature of created zero cost money. An infinite return on investment! Of course, you can get more GDP by removing all federal taxes too, by 4* tax. the federal balance of created money. By “conventional,” do you mean economists who were educated by professors who have no understanding of Monetary Sovereignty? My question for such people is: “How are your comments about federal finances different from what you would say about state finances? Surprisingly (or perhaps not surprisingly), that question never is answered on point. They usually digress into something off subject, and never do get around to the subject, which is money creation, taxes, borrowing, and inflation. I wrote recently and there were a lot of snide remarks about MMT. That’s why I asked the previous money balance which rubs them the wrong way. I literally wanted your comments after your reviewing what I asked you to review. Subject: RE: [New post] Liberals, conservatives and gold bugs talking past each other. Thanks. Anyhow, have you watched some YouTube videos of Prof. Kotlikoff here https://www.kotlikoff.net/node/8 ? He is a smart, prestigious, and experienced expert, and his ideas seem not bad. Let me get your comments after you watching some of his videos if you don’t mind. I agree that the USA is monetarily sovereign. However, it does not mean that we may ignore such a huge deficit and money printing, which may cause inflation and bubbles? Keeping balance is not important to have a sound economy? Depends what you mean by “balance.” If you mean a balanced federal budget, that would be a disaster for America. If you mean there is some point at which a deficit can cause inflation, I agree. But we are nowhere near that point, especially since that never has happened in ourhistory.